Digital to analog convertors (DACs) are devices that convert digital, typically binary signals to outputs in the form of voltage. The voltage generated can then be used to produce light, as in video and television or sound, as in MP3 players. Single-flux-quantum (SFQ)-based DACs fabricated using superconducting Josephson junctions generate voltages of quantum accuracy, which would be applied for metrological applications, i.e., realization of AC voltage standards. 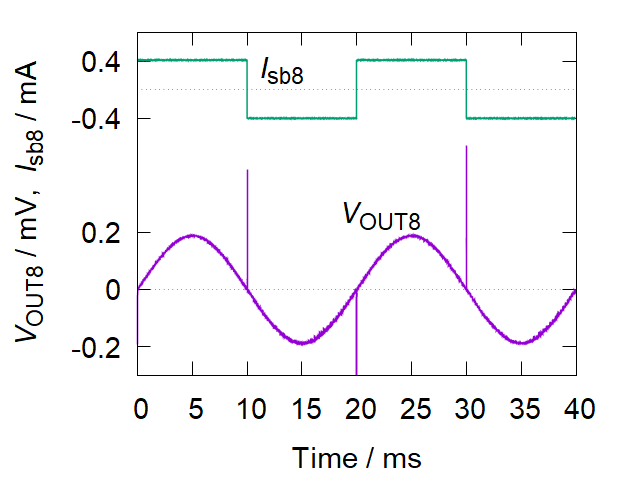 A group led by Yoshinao Mizugaki at the University of Electro-Communications in Tokyo has developed SFQ-based DACs producing only unipolar voltages, with positive polarity. This makes them less advanced than other available DACs for metrology. Their previous attempts to resolve the issue of unipolarity were quite exhaustive. The team has now attempted to develop their device by adding a simple fixture to the circuit. A DAC was designed using a so-called polarity-switchable double flux amplifier (PS-DSQA). The PS-DSQA consisted of three-junction loops, or stacks of cells, that produced output voltages with polarities corresponding to the polarity of deliberately applied (bias) currents. Thus switching the polarity of the bias current resulted in switching of the generated voltage. When an 8-bit digital input code was applied, in the form of a variable pulse number multiplier, the voltage generated was measured using an oscilloscope. The bias current was forwarded to a PS-DSQA capable of ±500 and ±8 fold magnification of voltage. Notably, the PS-DSQA produced positive and negative currents, albeit not of equal magnitude at ±500 fold. However, at ±8 fold, bias current conditions were more feasible for equivalent bipolar voltages. Sinusoidal waves were observed, indicating proper functioning and generation of bipolar voltages. Mizugaki and co-workers successfully built on their previous work, creating DACs with performances equivalent to devices currently available.